How can a program write out such a table? When programming becomes boring, there is usually a construct that automates the writing! All statements in the loop must be indented! An expression with value true or false is called a boolean expression. Examples: $C=40$, $C\neq 40$, $C\geq 40$, $C>40$, $C<40$. C == 40  # note the double ==, C = 40 is an assignment! Stupid and boring solution if we have many values! 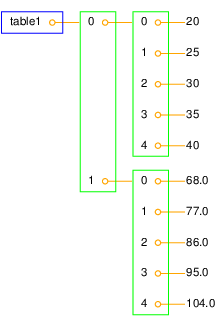 Elements are accessed via an index: L1 (index=3). 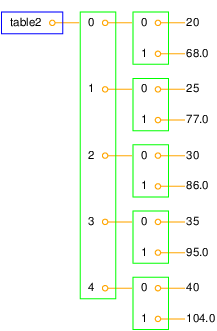 List indices start at 0: 0, 1, 2, ... len(L1)-1. 10 in C       # is 10 an element in C? As with while loops, the statements in the loop must be indented! But not all while loops can be expressed as for loops! Mathematical sums appear often so remember the implementation! range(start, stop, inc) generates a list of integers start, start+inc, start+2*inc, and so on up to, but not including, stop. range(stop) is short for range(0, stop, 1). Example: compute two lists in a for loop. Can we one loop running over two lists? Note: sublists (slices) are copies of the original list! Simulate this program by hand! How can we index element with value 5? Which month has the best weather according to the means found in the preceding task? Example: what can I find in the math module? For a newbie it is difficult to read manuals (intended for experts!) - you will need a lot of training; just browse, don't read everything, try to dig out the key info. It's much like googling in general: only a fraction of the information is relevant for you.